The Consumers Electronic Show (CES) is the world largest trade fair dedicated to new innovation and technology in consumer electronics, showcasing innovative products and trends of tomorrow. The event, which will celebrate its 50th anniversary, will open its doors from 5 to 8 January 2017 in the mythical city of Las Vegas. Since the first edition in 1967, CES has seen the biggest innovations that have revolutionized our lives. To name but a few, that’s where were presented in preview the VCR, the laser disk player or even the HD television. Bimp’Air, first autonomous and nomadic high pressure inflation system, has been selected to participate in this great event. 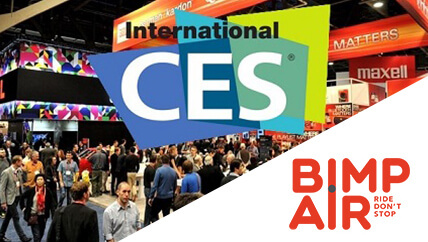 To get an idea remember for the 2016 edition, the CES brought 3600 exhibitors, including 250 French companies on 223,000 m2and 170,000 professionals welcomed. This innovation show is a great opportunity to get out of the bike universe and to introduce the system as an advanced technology and an object of daily life. The Bimp’Air capsule, unique and revolutionary, will be exposed among the world’s biggest innovations. Multifunctional, it will demonstrate that its use does not stop at inflating of tires or fork and shock absorbers adjustment; but it is indeed a consumer product. Bimp’Air looks forward to seeing you early January in Eureka Park on the ‘Sud de France’ Pavilion, to conquer Vegas!